Although Africa receives considerable monetary donations, medical aid and food assistance from wealthy nations every year, the country itself continues to struggle in a number of ways. Famine, poverty and armed conflict all remain enormous problems for Africa. 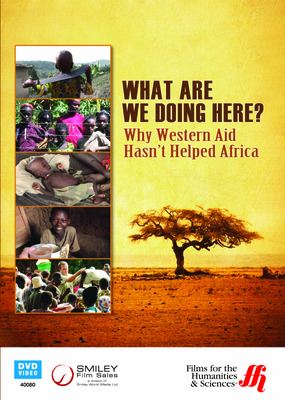 This 95 minute program takes a closer look at war, hunger, HIV/AIDS, U.S. farm policies, child sponsorship and NGOs as it relates to the lives of Africans today. Learn more about the lives of those who experience these struggles on a daily basis and gain new insights into the struggles facing this continent. Famine, poverty, war and HIV- in spite of receiving assistance from wealthier nations, Africa continues to struggle with these issues. This program evaluates the effectiveness of conventional humanitarian approaches to helping Africa in the form of medical, monetary and food aid. Follow four Americans as they travel throughout Africa to discover the intricate problems that continue to affect this country of millions. A wide range of topics are explored including child sponsorship, NGOs, U.S. Farm policies and the HIV/AIDS epidemic. Gain a deeper understanding of what life in Africa is like for many today and why Western aid has been unable to stem the tide of Africa's ongoing issues.